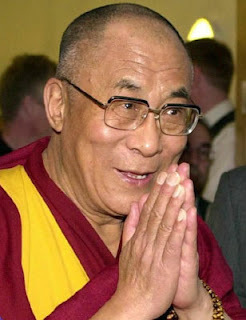 A few days ago I received an email from the Seeds of Compassion media coordinators that I had been approved for press credentials to attend some of the Seeds of Compassion events (an event lead by the Dalai Lama)! I am still reeling a bit from the news and definitely excited beyond description. I'm sure all of you seasoned reporters out there will take this with a grain of salt but for me this whole thing leaves me speechless! Me, press credentials? Yippeee! I could go into the details of how I somehow missed out on the myriad of opportunities to get regular tickets and was left without any option of seeing the Dalai Lama... but it would take too long and let's stick to the point here: the Dalai Lama is in town and I have been granted press credentials to see him - wow, simply amazing! Things will start this afternoon: picking up my press credentials downtown WITHOUT THE KIDS. Being that I am technically a stay-at-home mom on Thursdays and Fridays while my husband is at work, and being that the Seeds of Compassion media coordinators said that bringing the kids wouldn't be a good idea (gee, any other way I could show how inexperienced I am in these things) I started begging people to watch the kids last night at 9:39 pm. As for the event itself, I HIGHLY doubt I will be able to ask any questions or even get very close to the Dalai Lama or others leading the events. Nevertheless, I ask myself, what WOULD I ask the Dalai Lama IF I could? Would I come up with some profound question which would leave the other reporters nodding their heads in agreement and then asking themselves, "Who IS that inspirational press person over there?" "She is with WHICH publication? 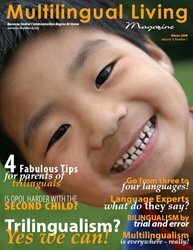 Multilingual Living Magazine? I will definitely have to learn more about her and that magazine! Maybe we can get her on board with our publication!" And they proceed to write down my name and the magazine's name and I'm feeling special and inspired and important and, dare I say, full of myself! HAH! How I make myself laugh! Ok, the reality is that if I could ask something I'd probably start with a few "Ummms" and "Errrs" and then fumble around with some kind of jumbled question which went nowhere and in the end the Dalai Lama would have to ask the person next to him "What EXACTLY was the question?" with a quizzical look on his face (yet a kind, compassionate smile). The other press people would look over at me (who was certainly beet red in the face with embarrassment) and ask themselves, "Who the heck let her in here!?" I'd look around, smile and then pretend that I was invisible (like my daughter when she wants to pretend like no one can see her, she wrinkles her forehead and just looks away in another direction until the attention on her has passed). Actually, the first thought that comes to mind right now is to tell him is how much I have enjoyed that Christmas calendar which I purchased for myself and my family and a few of my friends (and which I have on my desk at work) with daily quotes from him. Gosh, is that pathetic or what!? Talk about extremely un-deep and un-profound! Seriously, though, what would I ask him? What should I ask him? What would YOU ask the Dalai Lama? What thoughts would YOU share with him? What would be on YOUR mind? Tell me so that I can write them down (just in case)! You wouldn't want me turning beet red, now, would you?